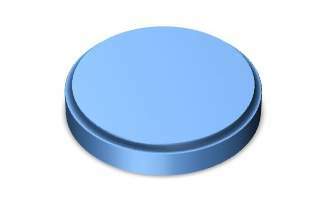 PowerPoint has made it quite easy to apply shadows to objects on the click of a button. 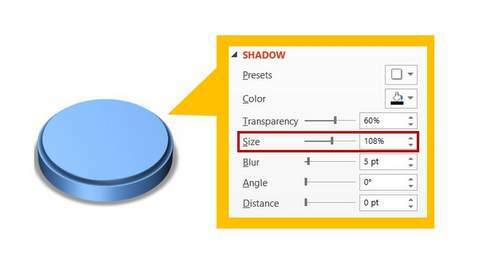 There are a wide variety of Shadow preset types like ‘Outer’, ‘Inner’ and ‘Perspective’. In each of the preset types there are a number of sub options. 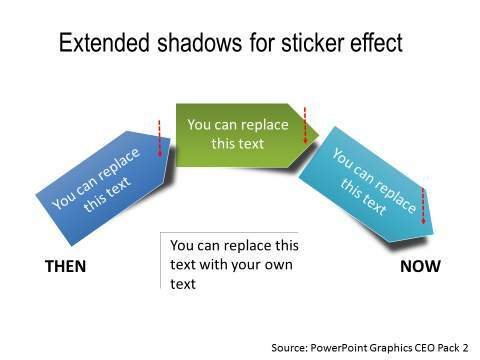 However, this problem of plenty causes three common types of mistakes while using Shadow presets in PowerPoint. 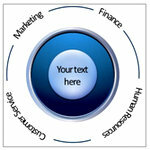 In this article, we will discuss the type of mistakes and the solution to overcome those mistakes. As you might be aware – shadows are nothing but the ‘absence of light’ caused by an object standing in the path of light. Since light source within a slide is expected to be the same, your audience subconsciously expect the shadows of all the shapes on a slide to fall on the same side. So, when you use shadow presets for your slides, make sure that all the shapes on a slide have the same type of shadow preset to maintain visual consistency. 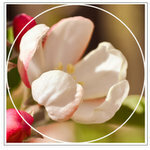 In the following example, you can see how selecting inconsistent shadow preset types makes the slide look unnatural. 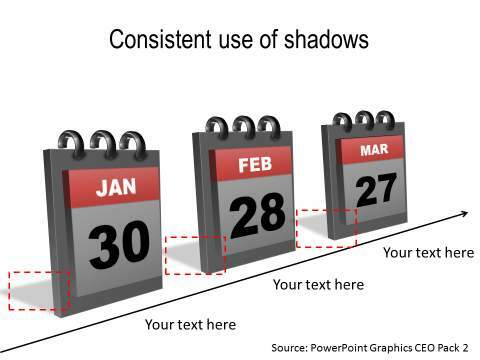 In the calendar diagram below, you can see how the different 3D calendars are aligned and similar shadows are applied to give them an even feel. Increasing shadow size can also help create interesting effects. 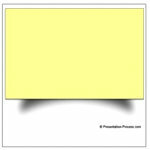 In the diagram shown below, you can see how we have created an effect of a sticky note to create an interesting template. 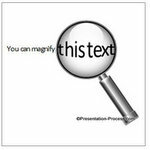 Quick Note: All of the example diagram templates showcased above are from the timelines section of PowerPoint Charts and Graphics CEO Pack 2. 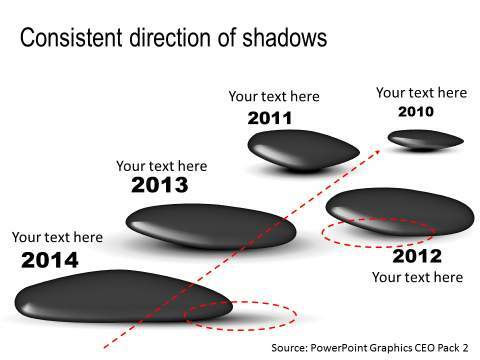 So, the next time you apply shadows to your objects, make sure that you don’t make the above common mistakes.